Tomorrow I have a photo essay from Rome coming your way, so I thought that this would be a bit of a teaser. As my photo essay will explain, I wasn’t supposed to be going to Rome on this trip. However, a bad day full of mis-communications and one rude Milan hotel receptionist meant a change to my plans. I’m certainly glad my plans did change as I really enjoyed my time in Rome. I had a great time photographing some of the most famous buildings in the world in Paris and London, so getting to add places like the Colosseum of Rome to my list of photo spots was amazing. As was been the case with most of the places I shot in Europe, my goal was to try and give a bit of a twist to a classic location and image. 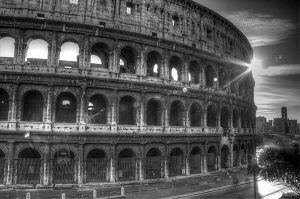 To do that, I tried to capture a really powerful black and white image of the Colosseum. In the end, I’m really happy with how this, and many of my Rome photos, turned out. There is all sort of tech to this image, but I don’t think I want to get into that. Rather, I’d like to talk about what sometimes has to go into getting a great image: going a step beyond the path. From the footpath, the image of the Colosseum was quite good, but there were some branches in the way and the lines just weren’t that visually appealing. Thus, I jumped the fence and set up my camera on the edge of the miniature cliff. From this spot the photo looks completely different than it would have just a couple feet away. The angle of the sun in the background is better, the lines of the building are more appealing and the composition is better. When you’re setting up a shot don’t just head to an open spot on the footpath and shoot. Get to a spot, look through the viewfinder, inspect every corner of the image and then ask yourself, “how can I make this image better.” Quite often you’ll find it’s just taking a foot off the sidewalk. Wow! That’s an amazing shot man. Props to you for going to the effort of getting it!